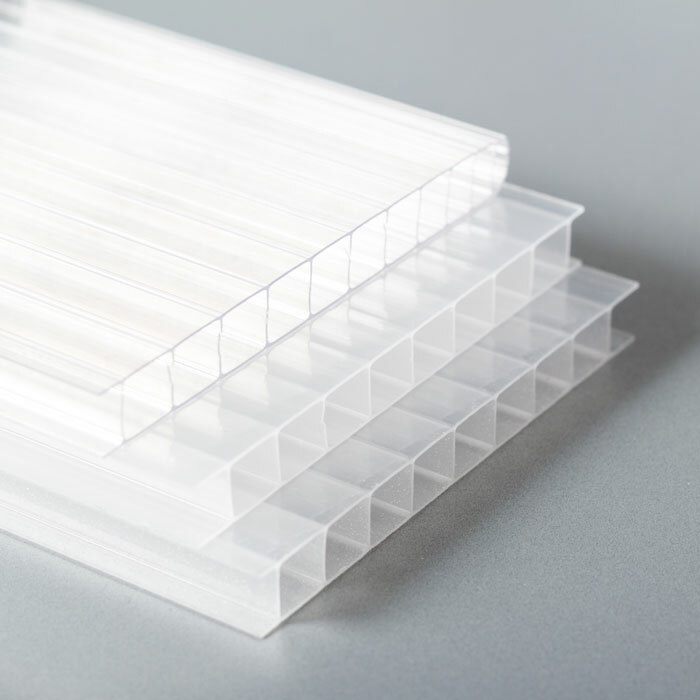 Cellular polycarbonate is another of the plastic options in our catalog. Especially used in construction and space design applications, it is a lightweight material that we recommend for its ability to resist weather conditions, with great insulating capacity and very affordable in price. 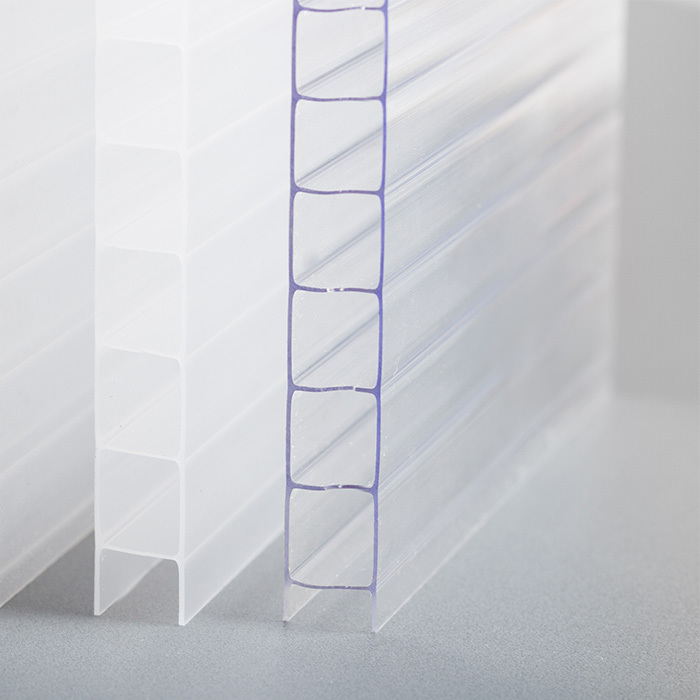 Available in sheets, we can offer various alternatives and qualities in cellular polycarbonate, with an alveolar structure that varies depending on the thickness. Get in touch with our commercial department and we will help you select your best option. We have sheets of cellular polycarbonate in transparent, bronze, translucent white, and ice styles. Ask us about availability of other colors and special formats. We are able to manipulate the original format to match it to the needs of your project. What does cellular polycarbonate offer our customers? Polycarbonate consists of very thin polycarbonate sheets, joined together by internal walls, creating a structure in the form of a cell. It is a material known for combining great firmness and durability with great transparency, all in a very lightweight format. It also stands out for its fireproof behavior and its resistance to high temperatures and extreme climatic conditions without diminishing its optical and mechanical properties. All this with ample possibilities when being worked, cut, or molded to adapt it to your project. 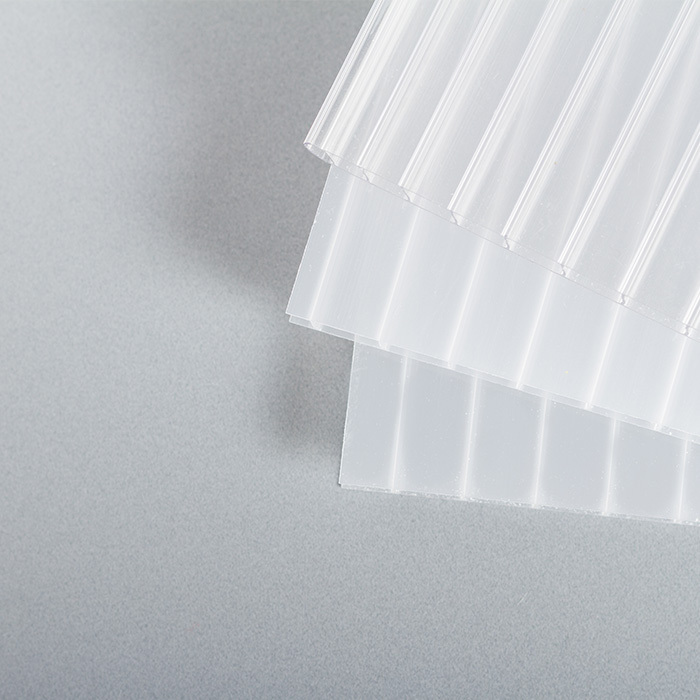 In the commercialization of cellular polycarbonate, it is key to choose the appropriate format for each type of project, to ensure that it offers the most suitable characteristics. Despite being a resistant material, its treatment and handling must be done carefully so that it reaches its final destination in perfect conditions. 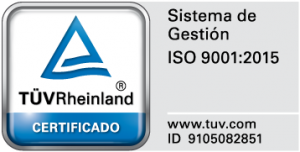 At Plásticos Ferplast our extensive experience in both aspects allows us to offer solutions that truly fit the client’s needs. We also have the precise technology to be able to adapt our orders to the client´s requirements, in their handling or transformation as well as in packaging, assembly, storage, and transport. Construction: roofs, skylights, facades, and balconies. Security glazing: shopping centers, schools, gymnasiums, transit areas, airports. Thermal insulation with panels of different formats. Signs, exhibitors, displays, advertising, signage, POS.